Good News: On November 25th 2010 the Kickstarter funding campaign was successful with 205%! The Campaign had many supporters. of how a designer can completely flip a genre signifier on its head. To get more information about the Typographic Wall Calendar please follow the link to the “prototype” 2010 Typographic Wall Calendar” here. Thanx for sharing! You’re awesome! 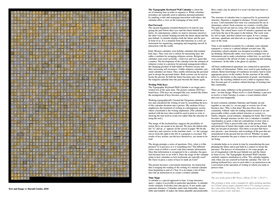 Update: The Typographic Wall Calendar 2011 and 2010 can be purchased here → https://haraldgeisler.com/order-prints/. 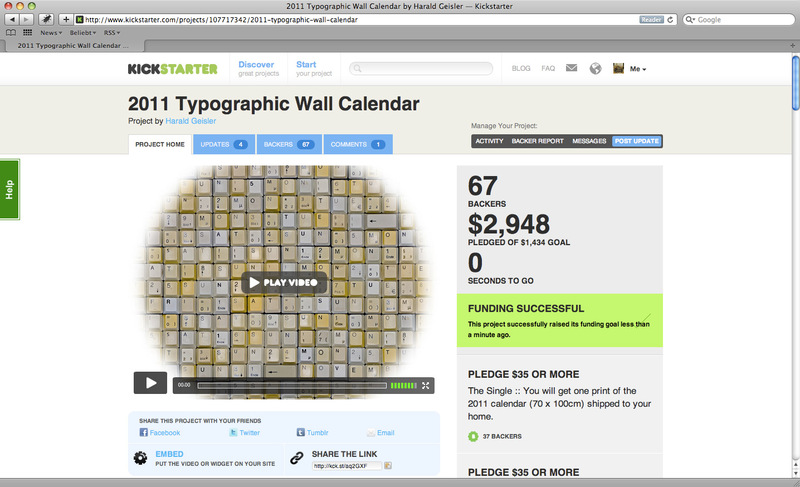 The Typographic Wall Calendar is about the act of notating time in order to organize it. While calendars nowadays are typically used to optimize personal potential by marking events and managing interaction with others, this calendar offers a view on the managing of time itself. “This keyboard calender by Harald Geisler has us wondering why we don’t keep calenders around the office anymore? Oh right, it’s 2010. Well, we figure a calender better be pretty unbelievable to have us putting away Google Calender, and this one really is. 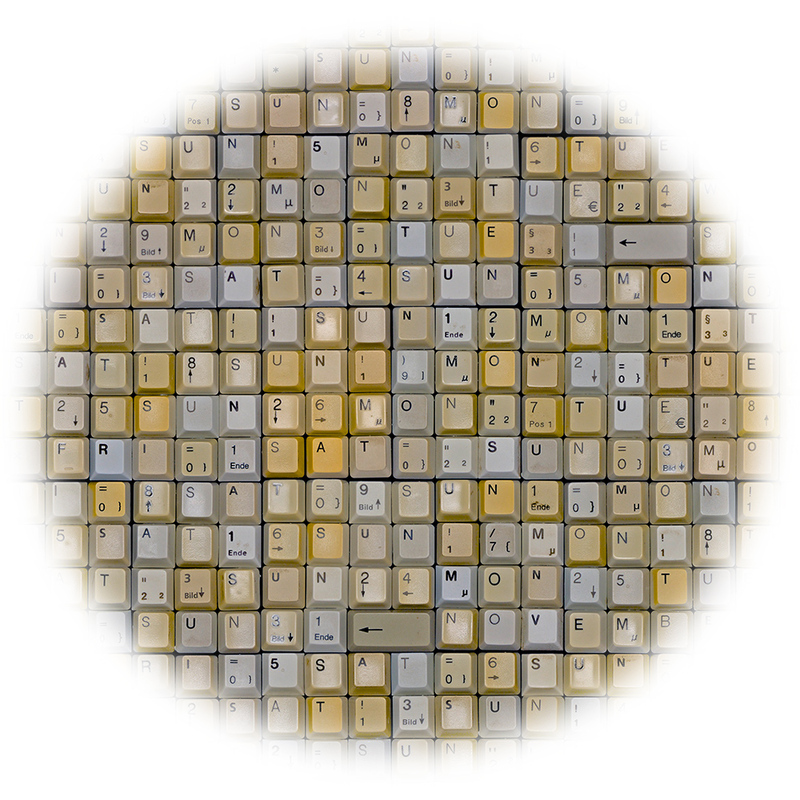 Made up of thousands of keyboard keys, this calender depicts the date in simple, effective, straightforward, yet dizzying way…” says Xiaoli Li from Formatmag. This is the wall calendar for the year 2010. 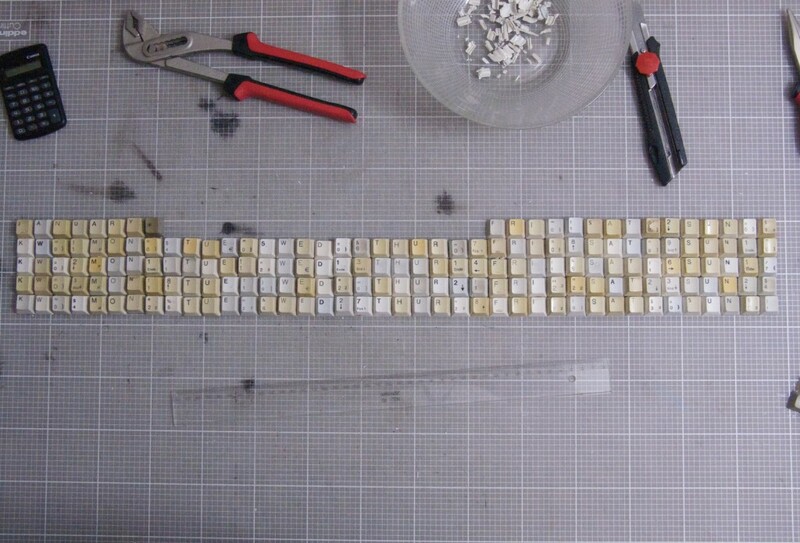 It’s made of two thousand and ten keyboard keys. This design offers a new visual experience of time, differently than your average wall calendar. It looks beautiful on the wall, and makes finding dates and marking events a creative process. 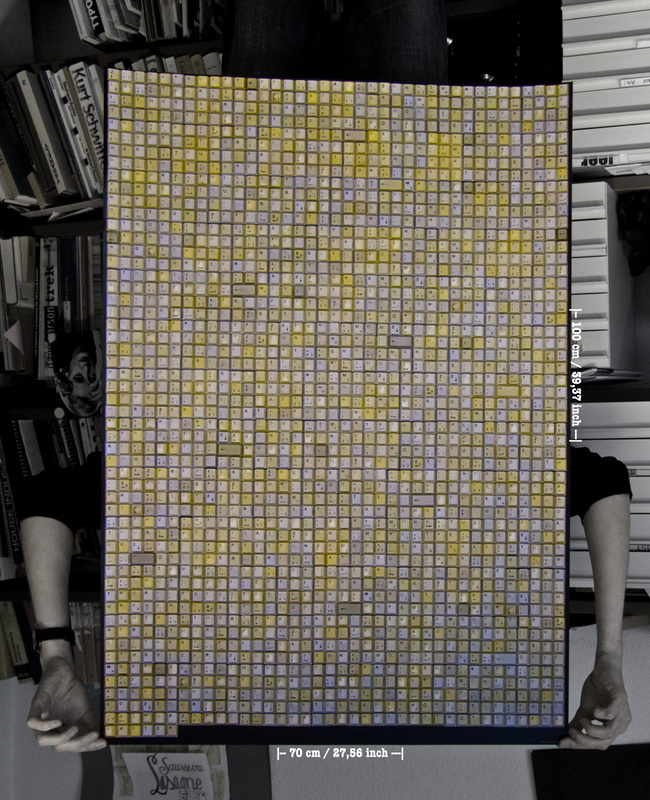 The size of the print is B0 70cm x 100cm (27.56″ x 39.37″). The printing is done with a standard 4c offset printing machine on 135g/m² glossy paper, finished with a UV coating to protect the colors from bleaching. The UV coating also provides protection against water and dust. The keys are arranged by hand and photographed line-by-line to achieve high resolution and minimize the barrel distortion caused by the cameras lens. The result is a gigantic image of 323 Megapixel (15119 x 21378 px, 1,83 GB Photoshop RGB). The Typographic Keyboard Wall Calendar is about the act of notating time in order to organize it. While calendars nowadays are typically used to optimize personal potential by marking events and managing interaction with others, this calendar offers a view on the managing of time itself. The ancient Egyptians oriented themselves in time by imagining the past before their eyes and the future behind their backs. In contemporary culture we tend to structure ourselves the other way around – looking towards the future ahead and the past behind. A calendar displays both the future and the past in front of us. It is a notation form that functions as a tool, an instrument for organizing, managing and imagining oneself in interaction with the world. Early Western calendars were holiday calendars that marked holy days. They were not a vehicle for measuring time, but rather a medium for arranging religious actions. Religious calendars were used cyclically — read over and over again like a mantra. The development of the calendar from the notation of religious events to a premise for personal management reflects the changing position of individuals in Western society and their increasing self-awareness. Unlike religious calendars, personal calendars are linear. They enable referencing the personal past to design the personal future. Both systems can be used to locate the present. In both the future becomes past, but only in the religious calendar does the past become the future again. The image of the keyboard key suggests the possibility of action. Keys are meant to be pressed. We press the button labeled “A” and an „a“ appears on the screen or paper. We hit the return key and a process in the machine starts – i.e. the carriage moves from the right to the left or a program is executed. The results of key actions, not the keys themselves, are meant to be read. The design prompts a series of questions. First, what is it [the picture]? Is it just keys or is it something else? The different colors seem to follow a secret code that contains information. Once that information is recognized to be a calendar, the question becomes how to act with it. Does the usage of this calendar relate to how calendars or how keyboards are typically used? Do I have to press a series of keys to mark an event? The picture becomes a movement instruction. An instruction that is imaging the reading of the writing of a normal calendar from beginning to end of a Year. It is no longer a list of holydays but an instruction to re-create a written calendar. A calendar is a special approach to time. A map structures space—makes it accessible to particular operations. A calendar works similarly. It divides time into pieces. It sets marks and generates distances. Calendars make time frameable, measurable and tradable. It makes the future planable and predictable. How could a day be planed if it wasn’t divided into hours or daytimes? The structure of calendar time is expressed by its geometrical structure. 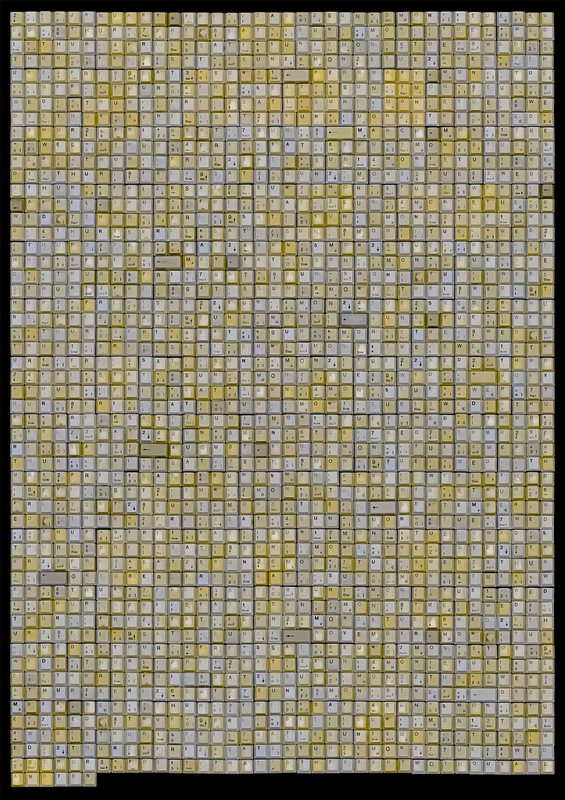 Duration is mapped to distance. Events expressed in area. I still remember how time was constructed for me in elementary school. Each semester we created a weekly plan. The grid moved one unit at a time, left to right, from Monday to Friday. The school hours (each 45 minutes) spanned one unit each from the top of the paper to the bottom. The week went by, left to right, and then started over again. It was a strange outcome–quadrants and intervals in a special map-like experience of the week. Time is not modeled accurately by a calendar; each calendar transports a vision or a cultural attitude towards time. My elementary school calendar was designed according to tabular thinking. Historically tables were used to compare lists of information and to make calculations within lists. 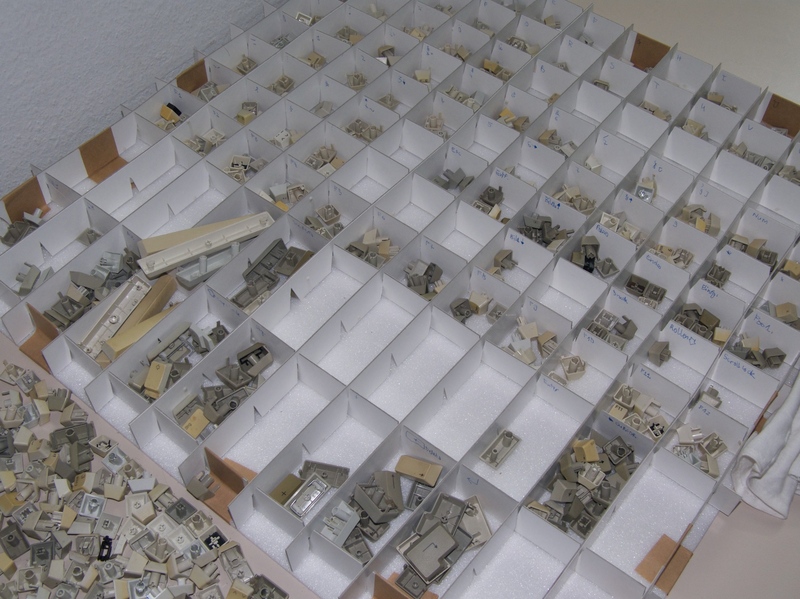 As such they were essential to the advent of trade–to organizing and running warehouses. In the table is the ghost of calculus. All basic mathematical operations are connected to operations with tables of information. Tables were used to gain trading potentials. Better knowledge of warehouse inventory lead to more appropriate prices on the market. So the structure of the table refers to calculation, to the organization of goods, merchandise, or wares. By teaching children to use a table to organize time, they become part of a modern cultural heritage of treating time like commodity. There are many subtleties in the geometrical visualization of time—in time design. When twelve o’clock Monday is put next to twelve o’clock Tuesday it creates a visual relation which does not exist temporally. In most common calendars Saturday and Sunday are put together as one unit (i.e. on one page or section size of one business day). Why is that done? Because these days are commonly without value for trading related actions or are not processable within a trade-related structure or system (i.e. family, religion, social relations, shopping for food). But if time becomes, through structure (in this case a calendar) a tradable merchandise or good, is that not contradictory to how time is experienced? Time is perceivable only in the present. Plans and prediction of future that might come real in the present, but they are not part of presence. Also there is no past that becomes present—just memories and recordings of the past that are remembered in the present but not relived. Whether we plan ahead or remember the past it relates to our direct and immediate being. A calendar helps us to orient in time by remembering the past, planning the future and to put both in a context to locate the presence. The process of orientation is, for some people, an act of imagination with the past behind you and the future in front of you. 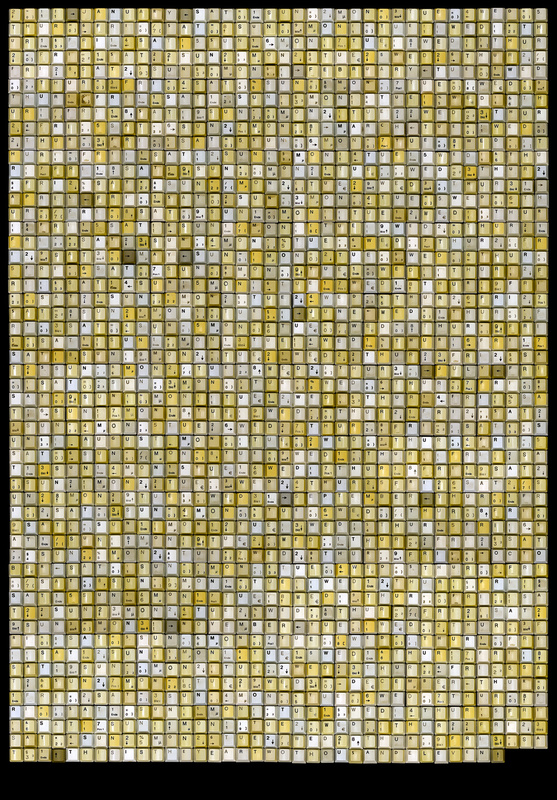 The Typographic Keyboard Wall Calendar similarly requires orientation in a flow. The calendar happens only when you see yourself in front the calendar. 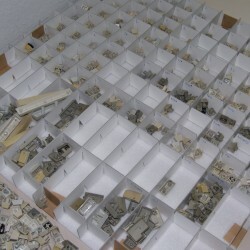 The view of putting keyboard keys next to each other is an instruction to do a movement in the operation of writing in which you mark or process time. The size of the print is B0 70cm x 100cm (27.56“ x 39.37“). finished with a UV coating to protect the colors from bleaching. The UV coating also provides protection against water and dust.